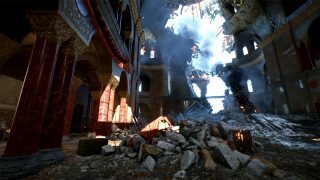 Fight through the war-torn streets of Tsaritsyn as the battle arrives at the heart of Tsarist Russia. The Battle of Tsaritsyn, 1918. Battle through the barricaded and ruined streets of Tsaritsyn as the Russian Civil War hits new heights between the Red Army and White Guard. Soot and blood cover the once-beautiful cathedral, where the White Guard prepares for the onslaught of the Red Army. Tight nooks and crannies will be your only hope for survival in this house of worship. Perched on a hill overlooking the Volga River and once used by hundreds of merchants before the war stands the shattered Merchant Office. Tarnished by heavy infantry fighting, now all that remains are trenches and makeshift barricades. Enemies might be found lurking behind each piece of rubble and inside every war-torn building. Your squad mates are your best hope to survive and emerge victorious.